Subtitled “Ukraine-USA,” the week-long event consisted of five evening concerts. The program included Mozart’s Night, Music in Hollywood, a chamber music project called Jack Heggie’s Vocal Cycle, a concert featuring the works of the highly eccentric American composer John Cage, and Vinnytsia Jazz Intersection, with the participation of Andrei Kondakov (piano, Russia), Max Hladetsky (double-bass, Ukraine) and Denise Perrier (vocals, USA). touch to the celebrations of the great Austrian classic’s 250th birth anniversary, it gathered genuine admirers of high-quality music. The musical extravaganza is the brainchild of violinist Iryna Frenkel and her longtime associate, TV personality Pavlo Tretiakov. Frenkel is the producer and director of Vinnytsia’s two biggest musical events and the head of the Charitable Foundation to Promote Podillia’s Local Talents. Together they also manage the 11-year-old festival International Days of Jazz Music in Vinnytsia. Musicians from 25 countries take part in the “20th-Century Musical Colors” forum, launched in 2000. About a hundred artists participate every year. To add pizzazz to the soiree, Sadovsky Theater artists acted out some scenes from the composer’s life. 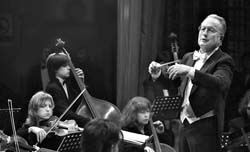 The action revolved around the Lviv Chamber Orchestra Leopolis, directed by cellist Yaroslav Myhal. In Vinnytsia the orchestra was conducted by German guest performer Peter Marx. The performer who made the most striking impression was pianist Oksana Rapita. A graduate of the Lviv Conservatory and the Gnesins Graduate School, and winner of two high-profile competitions — the Mykola Lysenko Competition and the Santander Competition (Spain), Rapita is an intelligent and mature performer. She is better known abroad than in Ukraine. Rapita played Mozart’s Piano Concerto No. 23 on a cabinet piano (with a broken mechanism to boot). The audience wondered how she managed to keep the shape and intonational sequence, convey the dramatic nature, subtlety, and refinement of this musical masterpiece, and instill her own artistic, soft, lyrical and very feminine personality. After hearing her performance, the audience will definitely remember this brilliant and unconventional pianist. The German conductor and his Lviv colleagues did a good job of Mozart’s Symphony No. 25 in G minor, K. 183. Maksym Hrinchenko, a Vinnytsia-born 2nd-year student at the National Peter Tchaikovsky Musical Academy (Prof. Anatolii Bazhenov’s class), a Vladimir Spivakov scholarship winner, gave an expressive performance of Violin Concerto No. 3 in G major, especially in the cadenza parts. 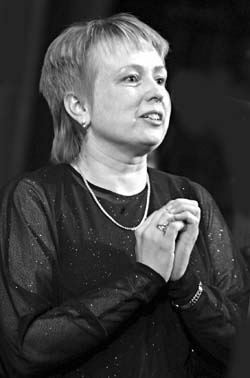 Equally good were three Nocturnal Serenades performed by a vocal trio (soprano Sabina Winter, Germany; mezzo-soprano Iryna Shvets, Vinnytsia; and bass Andrii Perebyinis, Kyiv) to the accompaniment of the Vinnytsia Strings Trio. Accompanied by Leopolis, Frenkel beautifully played a violin adagio. In the last act, Winter gave a brilliant performance of a few Mozart arias. The young vocalist recently graduated from the Richard Strauss Conservatory in Munich (class of flute and vocals). She is now playing in a symphony orchestra and has already been assigned two Mozart repertory roles. Her rendition of the arias and the duet between Masseto and Zerlina (“La ci darem la mano”) in Don Giovanni (with Perebyinis) was softly intoned, congenial, and even-timbred. Winter has stage charisma. She is graceful and quick-tempered, while the Kyivan bass, unfortunately, gave a lackluster performance in the solo numbers. He livened up noticeably in the duet and even achieved some emotional upsurge. Listeners that waited to the end of this musical and theatrical marathon were generously rewarded with the Little Nocturnal Serenade, which received several ovations. The second soiree was American. The Hollywood program attracted fewer listeners. The concert consisted of 10 compositions performed by the light and symphonic music orchestra, Leopolis. The stage was again the preserve of Lviv musicians reinforced by performers from Vinnytsia with Peter Marx conducting. The Music of Hollywood concert featured a medley of film themes and scores. The live sound was accompanied by the projection of stills from popular American movies, such as The Phantom of the Opera, Harry Potter, Pirates of the Caribbean, and others. The next performance was held in the Art Museum’s music salon. Curator Illia Bezbakh and his wife (and deputy curator) Natalia are very music-minded and creative people. The premises under their management are home to a small but gorgeous collection of 17th-19th-century canvases, sculptures, and antiques that once belonged to Polish magnates, including the Potockis. This is a tasteful collection of rarities that survived in the Vinnytsia region or were returned there. Approximately once a month, this beautiful museum salon gathers about 50 chamber music aficionados. This time they heard the 45-year-old American composer Jack Heggie’s cycle “Eve Song” set to the verses of Philip Little. The song presents the reflections of the first woman on earth about her right to motherhood and happiness. Sabina Winter sang to the accompaniment of Lviv pianist Myroslav Drahan. This was the first performance of this cycle in Ukraine. The eight songs followed each other according to the principle of contrast. Heggie’s style turned out to be traditional: tonal music, elements of expressionism, occasional jazz rhythms and harmonies, and down-to-earth, lyrical American musical intonations. Drahan proved to be a good team player and accompanist. Charm to the concert was added by emcee Eleonora Rozhkova, who teaches at Vinnytsia’s Leontovych Art School. Can you tell us about your teachers? In which city in Germany do you live?